Amsterdam The Hamster - REJECTED?!? I finally understand the hate. James Edward Raggi IV, for the rejection of Amsterdam the Hamster, you're on notice! And in order to make up for it you must immediately send me a copy of LotFP: Weird Fantasy Role-Playing. Thaumiel Nerub mentioned that he would be interested in my Witch of the Deep posts as a PDF. Matthew W. Schmeer begged for it. This PDF includes all three posts - The Witch, The Personal Charms, The Area Charms. I hope you enjoy! While most charms are designed for an individual, some are designed to ward an area. Often the enchantment on these is a stronger version than that of an individual's charm. Area charms need to be displayed appropriately in order to evoke their magic. 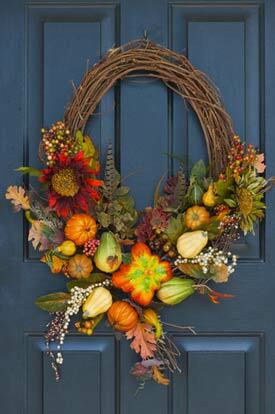 The charms are often hung on doors, or in doorways, though some are useful for outdoors utilization. 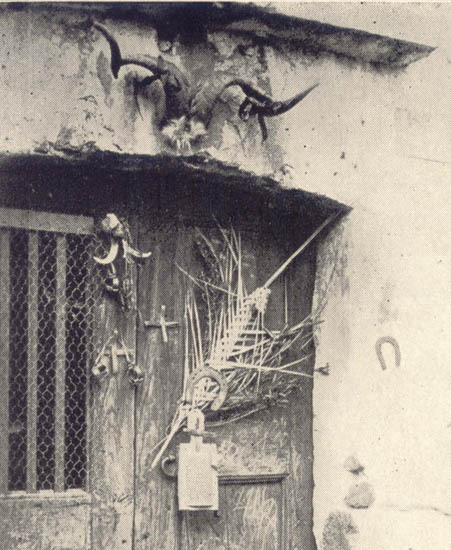 Common area charms take the form of wreaths, horseshoes, animal horns or bones, straw forms, and even simple bundles of sticks. Common enchantments include detecting certain creature types, warding against certain creature types, alarming an area, warding an area against general investigation or incursion, etc. Detect abilities will result in the detected individual(s) being wreathed in Faerie Fire. If found, roll on the following charts to determine it's function. Charms are minor magical items akin to potions and scrolls. They are single use items, usually intended for individual use, though some are designed as wards for areas. Charms can appear in a wide variety of forms, though they are most commonly found as necklaces, bracelets, medallions, and dolls, but nearly any small form can be used. 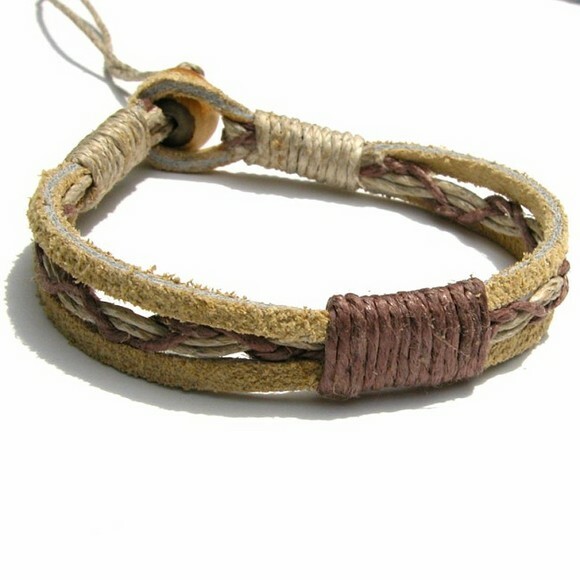 Often these charms are crafted in rough or primitive materials that fall apart when the magic is expended. Rarely they are crafted of fine materials and are enduring works of artistry even after the magic has been used. The most common use of a charm is as a protective device, usually providing a bonus to saving throws. The most minor of these charms will provide a bonus to a single type of saving throw (i.e. only dragons breath, or only rod/staff/wand) and only a single time. Others may cover a variety of saves or all of them for variable amounts of time/uses. The noise throbbed... it really wasn't a noise, more of a sensation that Allianora felt through her entire body. Judging by the looks on new friends faces, they felt it too. "I don't know..." Feris answered. The sphere flowed over itself as it floated above the stepped platform in the otherwise empty room. "What other thing" Feris asked. "You know... down the hall, away from this thing." "Oh, right, that thing" Nimble chimed in. "I agree, lets go look at that other thing" he continued, backing out the door. The swirling ball is a magically suspended ball of protomatter. A left over from previous experiments that the forgotten mage placed here both to save it for future use, and also because it made for a beautiful work of art. The protomatter itself is harmless, and would serve as a fantastic fertilizer or nutritious food substitute. It could also be used in a variety of magical experiments. The stepped platform is magical, and will suspend anything placed upon it 1-2 feet above its surface. Only one object can occupy the platform at a time. Allianora knelt with her head bowed inside the glowing circle. She ignored the soft flares that periodically flashed along the edge of her vision as she continued her prayers. The shifting transparent forms were confused and angry, and at least a half dozen must have been drawn to the circle. They flitted about like moths around a candle, and their soft moans mutterings filled the air. Her prayers were answered when the dungeon door slammed inward and a large man in scale mail took in the scene. The spirits reacted quickly moving toward the unprotected warrior. "Crap. We've got spirits!" he said, dropping his sword for a small silver dagger. He raised his shield, slashed with the dagger and worked his way through the doorway. Behind him a smaller swarthy man dropped a silver coin into his slingshot, and a young sorcerer raised his wand, blasting one of the spirits from the depths of the earth. Allianora raised herself, hefted her mace and holy symbol and joined the fight against the spirits that had kept her trapped. 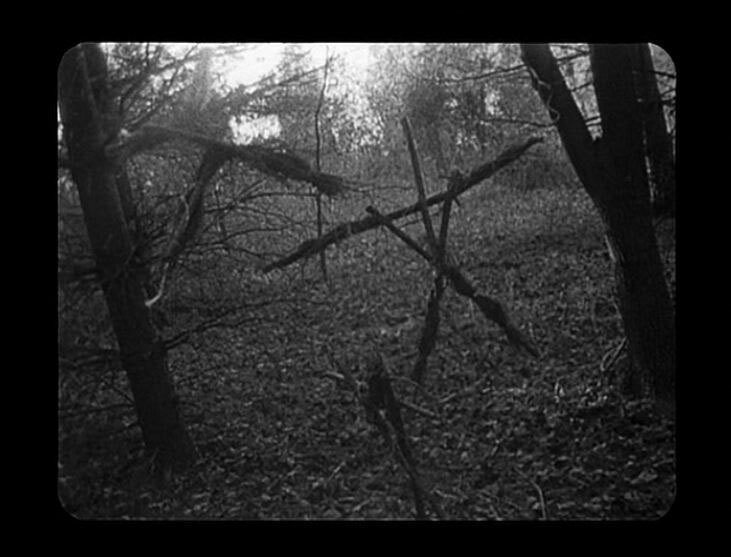 Restless Spirits are incorporeal undead formed by the spirits of those who died and yet can not move on, and have been driven mad stuck on the prime material plane. Their cold touch wounds the very life force of those it comes into contact with, causing both physical damage and also draining 1 point of wisdom with a failed saving throw vs. Paralysis. Drained wisdom will be recovered at a rate of 1 point per hour of rest. Anyone reduced to 0 wisdom is dead and will rise as a restless spirit. Due to their incorporeal state normal weapons will deal only a single point of damage per hit to restless spirits. Silver and magical items will cause damage as normal. Like all undead they are immune to all sleep, hold, and charm spells. The very sight of these creatures will cause a moral check for anyone with 1HD or less. The inspiration for this is from the video game Jade Empire. I wanted a low level incorporeal creature that wouldn't necessarily just trash a 1st level group on sight, yet would still be a fear inducing. The creature clung to the wall. It's powdery body leaving an a white trail as it moved toward the party. "What kind of spider is that?" Nimble asked. "It looks like a crab spider, but I've never seen one that looked like that before." Feris answered. Rathgar drew his throwing hammer, and tossed it at the strange creature. The hammer smashed into the creatures thorax, causing it to break apart into a small cloud of white dust which settled slowly to the ground around the hammer. "There, now we don't have to worry about it." He started to move to retrieve his hammer when Feris stopped him. "Lets give that a minute to settle. We probably don't want to breath any of that in" Feris cautioned "... but I do want to get a sample." 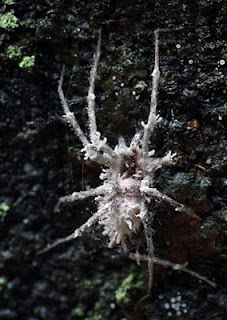 Arachnimold are actually a form of parasitic fungus that colonizes on spiders, killing them, and taking over their bodies. Primarily this is to increase the distance they can spread themselves. They will attack spiders on sight, and will react violently when threatened. They will constantly shed spores, leaving a faint white trail wherever they go. When they are killed they explode in a harmless (to non-spiders) puff of spores. *Note - this post is in response to JB over at B/X Blackrazor asking me why I feel that 4e is still D&D. I have no desire to argue about which edition is better. I hope that this blog, with it's focus on the Rules Cyclopedia, and posts about 4e, M20, Star Wars, etc. shows that I am not dogmatically tied to one game, edition, or company. I read, write, and play those things that I think are fun. **Note 2 - This is my blog, my post, and my personal opinion. I am not writing this to try to change your mind, to brainwash, feeblemind, or geis you into liking and playing 4e. I am writing it in order to try to explain my personal opinion so that others who come here will understand (not necessarily agree with) my point of view. In light of that, I ask anyone who decides to comment to be respectful, as always, of the author and other commentators. I'm going to start by answering the second question. Yes. I feel that Dungeons and Dragons, in it's current incarnation, is Dungeons and Dragons. But to understand the rest of the answer I have to tell you what Dungeons and Dragons is to ME. Dungeons and Dragons is, at it's heart, a fantasy role playing game. But what does that mean? It's a game, where people take on aspects/characters/avatars of fighters and wizards, of elves and dwarves, and they take these characters fantastic places. Locations like floating cities and dark dungeons, and even other planes of existence. These characters then encounter fantastic creatures like goblins, werewolves, and the titular Dragons! They interact with these creatures, and through this the players and the DM forge a story. The events of this story are often determined by the roll of dice. The dice used must include a d20. It's about getting together with friends to have a good time. I got into Dungeons and Dragons via the game HeroQuest, which lead me to the black box intro game. After that I got several of the other boxed games (Dragon's Den, Haunted Tower, Goblin's Lair), all of which included gridded map sheets, fold up cardboard characters and monsters, and I think 3 adventures. After that I got the Rules Cyclopedia, and then later I transitioned into AD&D2e. But I started with a very basic GAME that came with tokens and a board. We didn't always use them. A majority of the time we didn't use them, especially once I got the RC. But that's where I started. That's where the answer to "what is D&D?" was formed. Between my Basic D&D days we passed through the Rules Cyclopedia and Thunder Rift, stayed for a time in 2nd edition. Moved to 3rd edition, stopped playing shortly after 3.5 was released and took up wargaming. Thus we come to the release of 4th edition. It is a new game, with a new engine. Some sacred cows were slaughtered. Others were feed only the best organic feed and allowed to wander freely in their new meadow. But when I read the game, when I play the game, this is what I see: Fantastic characters, in fantastic locations, interacting with fantastic creatures. We roll d20s, we fight goblins at first level, and they can be deadly, all while sitting around our table with our character sheets, and thinking about raiding that dragon's hoard. 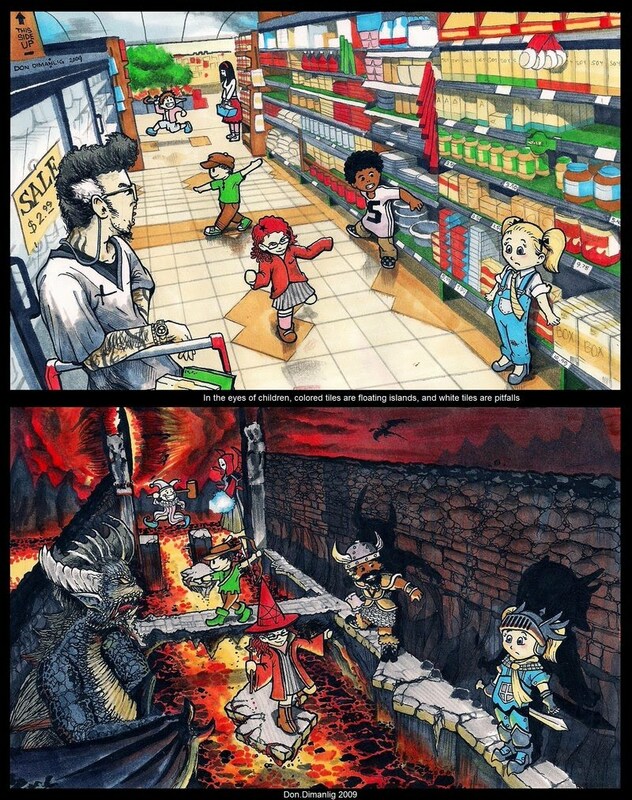 When I play 4e, it feels like D&D to me, just like it did when I was 11. So by my definition, what is D&D? Everything produced by TSR and WotC is D&D. The retroclones based on the SRD (S&W, OSRIC, Dark Dungeons, Labyrinth Lord, etc.) are D&D. M20, M74, M75 are D&D. I haven't read or played Castles and Crusades, but it sounds like D&D. Pathfinder seems to be D&D3.75. What isn't D&D? If you aren't rolling a d20 to hit something, with higher being better, than it isn't D&D. If you can't play a fighter, wizard, elf, dwarf, etc. It isn't D&D. If there aren't dungeons and dragons than it isn't D&D. If a game uses the d20 system, it does not necessarily equal D&D - for instance d20 modern or future are not D&D. The focus of 4e is different than that of the previous incarnations. It's much more about the game experience, and less about trying to "realistically" portray the happenings in the game. It is designed for those of use who don't have tons of time to play, and want to spend our couple of hours of live game time doing something awesome and fun. Is 4e the perfect game? No. Probably not even close. But it is fun, and sitting around the table with my friends, kicking down doors, slaying goblins and taking their stuff.... I'm playing D&D. So now you've seen it, hopefully had a chance to really look it over. A few of you have even given some feedback. (Thank you!) I'm already well on my way to getting the second level done, and I'm running into some themes. Gems and even jewelry seem to be way more common than I expected them to be. This leads me to think that somewhere deep down in the dungeon there is a mine, or maybe even multiple mines where all these gems are coming from. Magic seems to be pretty rare, at least in forms that are generally usable to an adventurer. I'm averaging 1 magic treasure per map (a few have multiple items). On the other hand, the magic that they find will be pretty powerful (the +3 warhammer that you've already seen for example). One thing that I'm considering along those lines is that there are several spell casters and chieftains in the second level who may have their own items. At the very least the arcane spell casters will have spell books, though rarely will a monster's spell book look like a human or elven spell book. The first level ended up being a single page... I'm not sure why. As I was drawing it, it just seemed to wrap itself up that way. The second level, by comparison, is currently at 5 pages. I'm counting the area past the giant rift as a lower level... Anyway, since the first level ended up being only a single page I kinda figure it'll be a bit of a bottleneck, keeping the baddies down below. Plus it seems like it's just enough to get the players ready for the larger 2nd level. Secret doors... yeah, adding more of them would probably be a good idea, otherwise they'll give up looking for them. The friendly/neutral NPCs in this level are going to be the kobolds. They're under assault from the ghouls and the wererats for control of the level, and happy for any assistance. In looking things over I realize I didn't make that at all clear. I'll have to revise this to make it more clear. I do have some ideas for NPCs on the second level... but that's for later. Large rooms. I have never been particularly attached to large rooms, in part because I never know what to put in them. I'll think about it though. What do you put in your big rooms? On Friday I posted the... well, probably not final draft, but a working draft of the first section of my megadungeon. I found this picture, and thought I would share, because isn't this really what it's all about? You dealt with the wandering monsters, heard the philosophy, looked upon the treasure, and found the monsters lairs. Now it's time to put it all together. In my last post you saw basically where everything goes, but there were still gaps. What were the traps and special things? Where would the treasure be found? Where do those stairs go? Lets start with the traps. Rooms 6, 9, 12, 13, 15, 18, 20, 24, and 32 have traps. I'm going to try to avoid duplicating traps in any section of the dungeon. I decided to start with a fun magical trap that always makes me smile when they use it in Order of the Stick: Explosive Runes. Now there isn't any reason it has to do as much damage as it does in 3e, so this is a lesser version doing 1d6 points of damage. I stuck that in a moldy library. 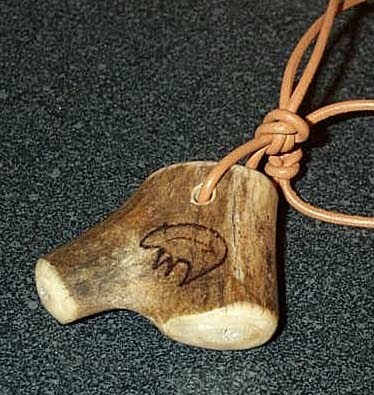 A spear trap is another common trap, and perfectly suitable for my dungeon. I'll stick one of those in there. Pit traps are also synonymous with dungeons. Not all traps are deadly, or even harmful. Some merely misdirect. An illusionary wall will make a hallway look like a closet. A sleeping gas trap at the top of the stairs could lead to some very memorable results. So can greased stairs. Traps can also... well... trap those that set it off. 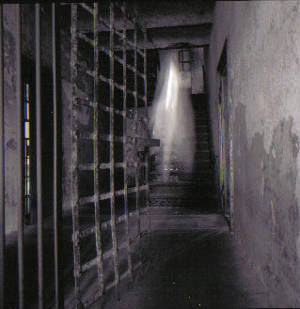 A dropping portcullis turns a room into a cage. How about a poison water fountain? The poison can be neutralized by silver! Now for the special items. These are always more difficult for me, because they are supposed to be special. I try to be at least a little original in the things that I give to my players to interact with. Rooms 26, 31, and 35 are my special rooms. Now I'm going to try 3 different specials: a weird, a helpful, and one that will directly interact with the players and may be harmful or helpful. A rain forest fungus room, a stuck door which will grant a strength bonus if opened, and a green devil face that likes to talk and eat gems. I think that covers just about everything. To see it all together you can download the first level of the megadungeon by clicking the link below. Download the Megadungeon Level 1 here (if you have a Google account)! Or here you don't (mediafire)! I hope you've enjoyed seeing it all come together, and if you have any comments and/or suggestions please let me know. This is the third in my series about stocking the first level of my megadungeon. This post deals with the monsters of the first level and the placement of the monsters in the dungeon itself. As I said before I decided to use my wandering monster chart to help determine who actually lives in my dungeon. For reference, here is the level 1 wandering monster chart. I also rolled 6 Traps, 3 traps with treasure, 4 unguarded treasures, and 4 special results. What to make of this? The stirges work best when they have access to the outdoors, so they'll go close to the entrance. The spiders, beetles, darkmantle, and green slimes can all be used anywhere in the dungeon as they're all unintelligent creatures/pests/vermin. The gremlin and the lemure are wildcards, weird things that can really mess with a party. That leaves me with the intelligent creatures - the ghouls, kobolds, and wererats. As an interesting note, the ghouls have a warhammer +3, the first and only magic item in the level! Obviously the skeletons will hang out with the ghouls in their own corner of the dungeon. The wererats and the kobolds are both sneaky, and both probably afraid of the ghouls, which helps explain the traps. Aside from that I'm guessing that the kobolds and the wererats have come to an uneasy peace, with the kobolds highly on the defensive, lacking the ability to seriously hurt the wererats. I'm thinking that the vast majority of the kobold traps will involve fire or acid because of that, and that all of the traps with treasure were set by the kobolds to try to lure the wererats to their death. Now that I have all that figured out, it's time to fill in the dungeon itself. Sorry for the formatting, but as you can see the first column is the room, the second was the roll it was associated with, and the last one is the room contents. You can see the map here. As you can see, I opted not to use 3 of the unguarded treasures, one of the specials, and one treasure trap combo. I am a little worried about my results, as the wererats are invulnerable to normal weapons, and ghouls are very deadly. If they aren't careful it could easily end in a TPK. There's still some more work to do on the dungeon, check back tomorrow to read about traps, special rooms, and to see the "finished" PDF! This is the second post detailing how I stocked the first level of my dungeon. The first post detailed my philosophy. This post deals with rolling up the rooms and their treasure. The third post will deal with the monsters and assigning them in the various rooms. I decided to use my wandering monster charts to stock the monster of the dungeon, figuring that if they're wandering around, then they probably live there. To determine what was actually in a room I used the dungeon stocking chart from the Rules Cyclopedia. I made a total of 44 rolls before I remembered that my first level only has 36 rooms. If the roll indicated a monster, I rolled on my wandering monster chart. Had I rolled an NPC Party I had planned to roll on the level 2 chart, but it never came up. When I initially rolled it I just rolled to see what was in the room generally. Does it have a monster? Treasure? A trap? And I noted that down on my paper. Then I went and rolled the treasures that weren't attached to the monsters. Then I rolled the monsters, and their treasurers. Finally I started looking at the totals, and I realized that I had rolled 32 gems for the level. That's 32 individual gems that I need to roll for. So I did, using the chart from page 226 of the RC. The first column is the gem number, the second the percentile roll, and the last column the gp value per the Rules Cyclopedia. For those of you keeping track at home that's 48,030gp worth of gems. Clearly that is WAY too much wealth for a level 1 dungeon. What's a DM to do? There were a couple of options. I could just drop the gems, or I could adjust their value or their placement. I decuided that I liked the idea of lots of gems, and so I opted to adjust the gem values! This is the same chart as above, but an additional column has been added showing the adjusted values. Now since I'm not using all 44 of the rooms I rolled, and one of the rooms I'm not using had 3 gems, I can lop 3 gems off the bottom of the list! Then I just hacked at the values till they resembled what I was looking for. This total comes to 5,280gp, which is significantly more reasonable. Has anyone else run into situations like this? How did you handle it? If you haven't, how would you in the future? This is the first post detailing how I stocked the first level of my dungeon. This post detail my philosophy in stocking the dungeon. The second post will deal with rolling up the rooms and their treasure. The third post will deal with the monsters and assigning them in the various rooms. There are certain things I'm trying to do with my megadungeon, and one of those things is to keep it old school. Graph paper and pencils to map it, with interesting shapes, 10 foot per square scale, and increasing deadliness as you go down deeper. I'm keeping in mind the weirdness of dungeons, and I'm not going to shy away from magic pools, talking statues, and other assorted goodies. I'm also keeping in mind that this isn't some basement, or castle prison... this is a Mythic Underworld! Not everything will make sense, and in that vein I want to randomly roll what is in it, and try to stick to the rolls I get. That was the theory anyway. In practice that turned out to be a lot more difficult right from the first level. While I understand that things aren't necessarily balanced, and in fact can be rather highly unbalanced, I ran into a problem that basically forced me to make major adjustments to the results of my rolls. It's pretty obvious that a series of somewhat improbable rolls could make a level unplayable without the DM stepping in and tweaking things. As it is things are still going to be pretty interesting with some really tough potential encounters, but there will be more about that in the upcoming posts. I'm guessing that true old school DMs do what I've been doing, tweaking things so that it fits, but I'm not sure. What do you do if you somehow roll a treasure that is great enough to raise a party's level from 1 to 6 in a single delve? Or roll a series of monsters that will slaughter the party? Do you send your players into your dungeon and see what happens or do you tweak it? I used the Rules Cyclopedia charts as a base, and shuffled around some things. I disliked the random human entry that took up so much space, and figure that NPC Party pretty much covers that. I plan on making a separate chart for that result, which will include a possibility of a lone person. When I stock the dungeon these will be the monsters I plan on using, though I'll use the number of creatures as indicated by the lair entry. I think that I'm going to restrict each level to a single NPC party, so if I roll more than one of them for a given level, I'll use that roll to do something weird that isn't on the chart. I was thinking also, that rather than roll for each room specifically, I will roll up a bunch of room encounters, and then fit them into the dungeon in slightly less random order. So I can group a couple of orc rooms together to make a clan. Anyway, that's the idea. Rathgar grunted as suddenly the world went dark. Not the first time things had gone dark for him, but usually it involved much less a strangling sensation. Muffled voices started yelling "Get it off him!" and "What is that thing?" He dropped his weapon to grab at whatever it was that was trying to choke the life out of him. It's rubbery skin covered rope strong muscles. Suddenly he felt a sharp wack to the side of his head. "Ow!!" WACK! Rathgar grunted and stumbled. "I said don't hit it!" Feris repeated. "Your hurting Rathgar!" "If I don't hit it how do we get it off?" Nimbles muffled voice asked. "Like this." If Rathgar could see, he would have seen a flash shoot out from Feris' wand, striking the creature. It screatched and released Rathget, and flapped it's way up to the ceiling. The darkmantle is an underground predator who lurks above, dropping onto their prey's head, and strangling them to death. If they suffer much damage they will disengage and try to fly back into the darkness. A darkmantle gains a +1 to it's suprise roll due to it's natural hiding ability. If the darkmantle has surprise it gains a +2 to it's attack roll. If a darkmantle beats it's to hit roll by 4 or more it has successfully wrapped itself it's prey's head, and can automatically cause 1d4+2 points of damage per round. Any damage caused to a darkmantle that is wrapped around it's prey, half is delt to the prey. A successful open doors check will remove a darkmantle, but doing so causes an additional 1 point of damage. Feris turned, looking past the firelight of the camp. Large yellow oval eyes looked back at him. "I want you to know I mean you and yours no harm. To be completely honest I want to offer you a gift" the voice whispered. "Power." The voice paused. "Just a little power." Something below the eyes began to glow with a golden light. The light illuminated a squat misshapen body. Feris frowned and sighed. "Begone devil. I want none of your gifts." He then grabbed his wand from beside him, and when he looked back the creature was gone. The lemure are the lowest forms of devils, used as minor tempters, messengers, and spies. They may naturally become invisible, and are immune to sleep, charm, and hold spells as well as normal weapons. Silver and magic weapons will do normal damage. "Please don't go away!" the metallic voice whined. "You need me!" "I don't need no loud mouthed robot mucking things up for me. You're useful, but you never do shut up." "It isn't like I ask you for much, just kill some people for me. It isn't even like they're real people. Muties aren't real people..." The head began. "Only humans like you are real people, humans and androids of course. See, that's what being nowadays don't understand! They aren't human, so they aren't people. It's really a pretty basic concept, even for a dumb meatbag like you!" "See, this is why I'm leaving you here." The door swung shut, leaving SI-351840189910d in the dark. "If I had my body you wouldn't dare leave me here!" Sid yelled. No one answered. Not for a long time. 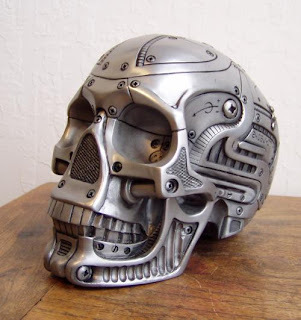 Sold it to a blue devil mutie for everlasting life... as a head. Stolen and sold as scrap by a bunch of sewer dwelling troglodyte muties. 52,000 roman coins were found recently in Britain. "The coins were all contained in a single clay pot. Although it only measured 18in (45cm) across, the coins were packed inside and would have weighed an estimated 160kg (350lb)." Even if they were all copper pieces that's a pretty nice find considering he didn't have to slay a dragon! The skeletal horse beneath him was bony. This came as no surprise to anyone, not even Josh, but it was still an annoyance. The zombie horse had been worse, first with the smell, and then with the leaking fluids that got on everything. You have no idea how hard it is to get horse guts out of an expensive cloak. "Form up! Spears at the ready!" It was nice how they all listened to him now though, and that made it worth putting up with the little annoyances. "We march!" As one, the force moved forward. The village elders would be surprised when Josh marched in with his new troop. Bandits had been plaguing the area, but with a force of 30 skeletons and a few odd zombies, he could defend the village from anything! They would have no choice but to offer him Elana's hand in marriage, especially since he was the only one his new troop would listen to. "Josh's Bones! No... Maybe The Dread Defenders? No... Josh's Dread Defenders!" His musings were suddenly cut off as a pair of logs rolled down the hill toward his troops flank. He barely had time to yell "SCATTER!" before it started smashing into his troops, shattering them. From behind a tree ahead the village priest stepped forward brandishing his holy symbol, and with him was a tall young man in blue and yellow robes holding a wand at him. "Begone foul creature of death!" Belairgron the priest called out "Trouble our village no more!" Josh raised his hand to order them to stop their attack when he felt a sharp pain in his back. Reaching behind him, he felt the arrow piercing his back. "You shouldn't have stopped me" Josh whispered. "I'd have helped..." A second arrow, and then a third pierced him before he fell. As his body dropped to the ground his host fell unmoving too. The Helm of the Pale King is a skeletal mask attached to black fabric that is pulled over the owners head. When so donned the wearer will appear to transform into a skeleton headed undead creature. The wearer will also have the ability to raise and control up to 40 hit dice worth of lesser undead (under 3 hit dice). The magic of this mask will protect the head of the wearer as a full plate helm. Caldur tossed him once more across the room. Edgar slammed against the wall and slumped to the flood. "I grow tired of you." Caldur frowned. "It's a shame too... you're the only one to give me any sport at all!" He walked over to the golden mace that glowed with an inner radiance. "Where ever did you pick up a holy weapon such as this? I supposed you looted it from some tomb like this one." He squatted down next to the mace, holding his hand just above its grip and squinting into its light. "Pity it's just going to have to sit here for now. I suppose it wont even collect dust, will it?" Caldur turned to look at Edgar, and found him pulling himself on his one unbroken arm toward a backpack in the corner. "Oh, now what could you want in there? A healing potion? Or even some holy water? Let's see shall we?" He stepped over to the backpack and picked it up just out of Edgar's reach. Right on top he finds a small vial of holy water. "We'll dispose of that, yes? We wouldn't want anyone to get hurt." Caldur poured the holy water on the broken man at his feet. "Feel better?" Looking back in the bag Caldur notices the sparkle of amber. Reaching in he pulls out a small carved amber skull, just big enough to fill his hand. "Now that's gorgeous!" He squats down and holds the skull in front of Edgar's face. "You have to tell me..." Caldur says softly "where did you get this! It's exquisite craftsmanship." Edgar smiles through broken teeth and says "Pelor's temple in Afar. It's called Dawn" With that final syllable the amber skull begins to glow with a blinding light that lasts only a few seconds. As the light fades the skull drops to the ground next to a pile of ash. Edgar lays still, breathing slowly through the pain, thinking about the healing potion that Alan always kept on him, hoping it survived the vampire's assault. 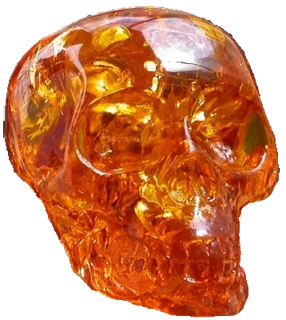 Dawn of the Sungod is a carved amber skull about 3 inches in diameter. Once per day, after having been exposed to the first rays of the morning sun the Dawn of the Sungod can release the morning light in a single round, damaging or destroying creatures vulnerable to natural sunlight. The Dawn of the Sungod may instead be used to release daylight more slowly, acting as if emanating a light spell with a 6 hour duration. The sunlight may be stored indefinitely before being used for either power. The command words are "Dawn" for the sunburst, and "Radiance" for the light spell. "Frostbite once ruled these lands with an icy talon. It was me and my men that brought you freedom from that wyrm not twenty winters ago!" The clan-chief bellowed slamming his drinking horn onto the rough table. Spittle collected in his beard as he raged at the pair before him. Wrapped in furs Freydora stood calmly at the chiefs rage. "And we've honored you for that service for the last two decades." The raven-haired female said softly. "Now it is time for you to move on." "You impudent little..." The chief grabbed his double bladed axe from the wall. "I'll teach you a lesson in respect!" 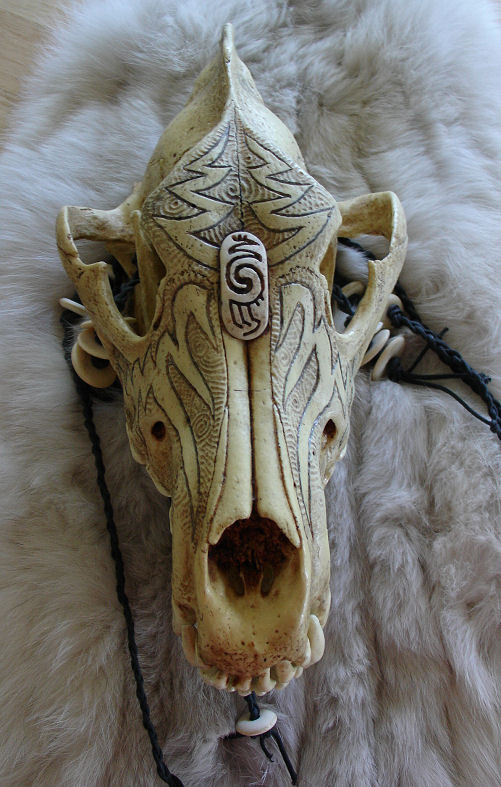 Freydora stepped back, tossing the furs off, revealing a dragonskull strapped to her back. She tugged the thin ropes holding it on, and it swung down to her side. She scooped it up, holding it by it's eyesocket out toward the chief. "Leave this place, and do not return." He laughed, and raised the axe, and was slammed back against the wall by by an icy blast. Frostbite is an enchanted white dragon skull and jawbone. The skull can be used to cast Icy Blast (as lightnight bolt cast by a 7th level caster) once per day. The jawbone can be removed from the skull and used as a pair of dagger +1/+3 vs cold/arctic creatures. Rufus walked slowly on, the soft tapping of his shovel marking his going as he made his nightly rounds. George, his constant companion, sniffed helpfully at the base of an ash tree. The lantern squeaked a little as it rocked with each step, it's yellow light casting shadows among the tombstones. "Come on boy, only a little more to go, and then we can fry up those sausages we got from Miss Sims." George's golden tail wagged gently back and forth, and his mouth watered at the thought of sausages. They walked a little bit further on before the lantern light began to flicker, and as it did the color shifted to more reddish tones. George let out a soft wine. Rufus, made a slow circle, holding the lamp out in front of him. 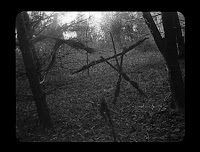 One of the graves, a fresh one, gave off a reddish glow and the ground began to push upward. Rufus walked toward the grave, arriving just as the zombie got it's head above ground. "Margaret, go back to sleep." Rufus said, squatting down just out of the braineater's reach, the lantern between them. "Go on now. There's nothing for you up here." The zombie grunted, it's eyes drooping, and it squirmed back under the dirt. Rufus returned the dirt to the grave with his shovel. "I know I ask you this every time, but why would anyone ever put a graveyard over a Hellmouth? I'll never understand some people." He sighed as he tapped down the dirt one last time. "Lets go get those sausages." he said as he patted George on the head. 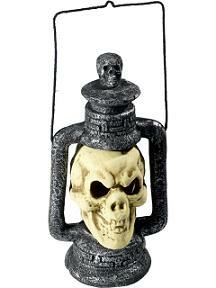 The Stygian Lantern is a magical lamp made of black iron and a human skull. In all respects it functions as a normal lantern. In addition while in the presence of undead the lantern's light will become red (detect undead 30' constantly). This will reveal even invisible undead by causing them to glow with a reddish nimbus. It will also allow the bearer to turn undead as a 3rd level cleric. It was the perfect time and place for an ambush; twilight, along the bottom of a small valley trail. The trees provided cover, and the moderately steep hills limited the escape possibilities. Unfortunately for Ulrick, he realized this moments too late. The rustling of leaves heralded the goblins trap, and while they aren't much trouble in small numbers, Ulrick found himself surrounded by significantly more than a small number. "No move! No move!" Several of them called out. 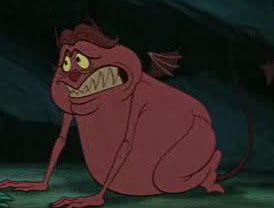 "Wants your gold" one of them snarled "an we maybe not cuts you." It was a tempting offer, or it might have been if only to avoid the bother, but Ulrick was carrying many times more than he was willing to part with. He had a deal to conclude after all. "Very well" he said, and reached into the bulging sack at his side. A simple skull was all that he removed, and in the moment before he tossed it to the ground, the assembled goblins became slightly more wary of their trapped mark. The skull rolled a few feet, and came to rest under the filthy boot of a goblin, who looked down at the skull, and then up to Ulrick with a quizzical expression. His look quickly shifted to surprise, and then pain and the skull (and his boot) caught fire. The flaming skull rose up from the ground, and a body formed beneath it. Clad in black spiked leather, the figure whipped a chain around, and smashed it into the nearest goblin. Zarathos was once a great human warrior. During his time he defeated all those who stood in his path, gathered an army under his banner, conquered several small boarder kingdoms, becoming one of the mightiest warlords who've ever lived. As time passed he challenged mightier and mightier foes, slaying dragons, and demons. Eventually he raised the ire of several lesser demon princes who jointly dragged him into the abyss. To the dismay of his abductors, Zarathos' soul was already so blackened that he became a demon prince himself, and he slew them all. He went on to lead armies of demons before he was stopped by the Paladin Citadel and his band. Stopped, but not destroyed. Zanathos' spirit has been contained within his own burning skull, and he can be brought forth to fight for whoever owns his skull. 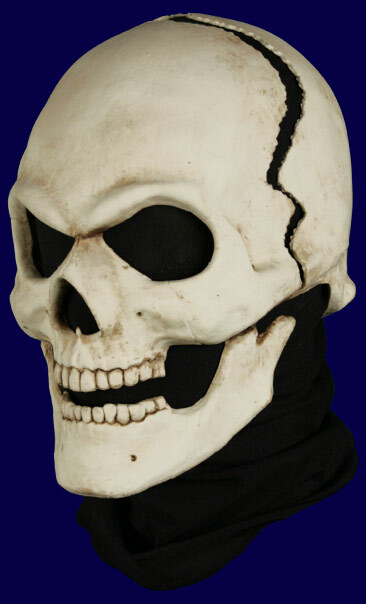 The Skull of Zarathos is an evil enchanted skull. Once per day the bearer of the Skull of Zarathos can summon the spirit of Zarathos to fight for them. Due to his defeat and confinement Zarathos' power is greatly diminished from his time as a demon prince, and he will fight (roll a d4 and use the stats for a hill(1), stone(2), frost(3) or fire(4) giant) for no more than 10 rounds. His chain is +3/+5 vs Demons, and can be used as if it has a range of 10'. 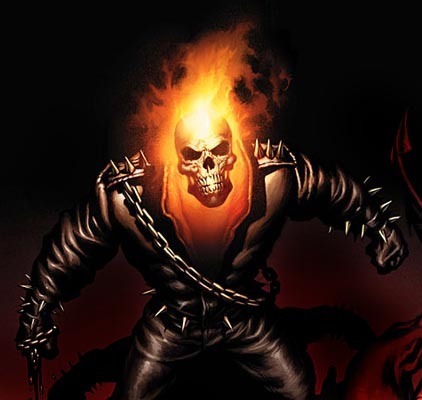 The Skull of Zarathos also has a power score like a magical sword of 16 and an alignment of Chaotic (or Chaotic Evil), and it will attempt to take control of whoever wields it, as would a magical sword. It will also make an attempt every day at sunset. Should Zarathos gain control he will take over the body of the wielder, rather than manifest as a separate individual, and will remain in control until the next sunrise. Rathgar bashed his shield into the face of the gnoll that charged him from the side. Nimble ducked under Rathgar's blade and around his flank to stick the dazed gnoll with his dagger, just as Rathgar's blade finally made it's way around to cut into it's shoulder, dropping him to the ground. Feris, pulling an evil looking arrow from his thigh summoned a protective barrier around himself. The dead gnoll's fellows drew back from the adventurers, forming a tight line between them and their pack leader, all the while, cackling that hidious laugh of theirs. The jackle faced wokan, protected by her hunting party, reached into a sack and removed a tentacled skull. She slipped her fingers into the four puncture holes in the back of the skull and held it in front of her. Feris could feel the pressure inside of his head. It was looking for something. "She's in my head... GET HER OUT!" he yelled. Rathgar drew a throwing ax, and lobbed it at the wokan. One of her pack got in the way, causing a mere glancing blow. Nimble whipped a dagger at her, managing only to nick her ear. She smiled as blood began to flow down the side of her face, making her fur even more disgusting. The tentacles of the skull stretched forward as if reaching out to something, and the wokan pulled the skull backward. Feris heaved forward and dropped to one knee. The wokan swung the skull back toward the adventurers and suddenly Feris started talking. "In the First Dynasty, under the rule of Empress Sato, there was considerable misery for those not of human blood. And woe to those who shared blood with non-humans. It was a dark time, let me tell you!" Feris' face scrunched up and he looked at Rathgar and Nimble for help, yet continued talking. "Yet at the same time it was an era of unity for those people under her fist..."
Rathgar grabbed the babbling wizard "Lets go!" Nimble was right behind him as the gnolls began to advance. Spell Thief is an enchanted illithid skull. Skull has 4 puncture holes in the back and 4 rubbery tentacles remain attached to the beak. When used it allows an arcane caster to scan the memorized spells of a rival arcane caster, 1 spell per round, starting with the lowest level spells. If the user of Spell Thief finds a useful spell they may steal it from the victim, and the next round cast it at the level of the victim. Once Spell Thief has stolen a spell it will not function with either of it's abilities until the next midnight. Can you believe that there isn't a picture of an illithid skull out there? At least not one I could find. So, I made my own! That makes this the first post ever of my own art! The room was cold. A thin layer of frost covered every surface. Delicate ice ferns seemed to grow across stone and glass, and in the far corner of the room a spider's web was captured in this unnatural winter's embrace. The goblin's feet made soft crunching noises as it stepped cautiously into the frozen room and looked around. His clan-mates stood outside the door, unwilling to leave the summer warmth of the ruin for the unnatural cold. Goosebumps covered his arms, and his breath came out in billowing white clouds. The glass-doored cabinet was completely frosted over, but he knew that shiny trinkets were often kept in such displays. He opened the door, and saw what he had hoped. Numerous knickknacks filled the shelves. He grinned, his wicked teeth showing gaped and yellowed. 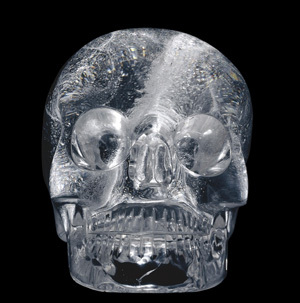 Then he saw it looking back at him; a crystal skull, swirling with cold. He shivered from that cold visage, and his crooked teeth began to chatter. "What is it?" Pell called out to him. Shaking near uncontrollably he closed the doors. "Nothing, it's already been looted." He turned away from the cabinet. "Lets go, this place is cursed." "Cursed!?" His clan-mates hissed and backed away. Winterkill is an enchanted crystal skull that always appears to have a blizzard blowing inside of it. With the proper command word, the bearer of Winterkill can summon forth a very localized snowstorm 3 times/day lasting for 10 minutes. This snowstorm reduces viability to 5', reduces movement to half, and causes 1d4 points of cold damage every round that a creature is in it. This snowstorm occupies an area of 120'x120'x120'. The bearer of Winterkill suffers from none of these effects, and will never have their vision impaired by winter weather. The woods were quiet as Nimble sat with his back to the fire. The usual host of crickets and night birds chirped and hooted, but nothing larger seemed to be moving anywhere near the camp. Opposite Nimble a faintly luminous form also sat unmoving, looking out into the dark. Rathgar lay still upon his bedroll, dead to the world, yet his hand still gripped the blade that rested at his side. Feris rolled over when the fire popped, cracking one eye and mumbed out "Go to sleep Nimble. Fido's watching the camp." and then pulled his blanket back up and was again asleep. Nimble sighed and looked over his shoulder at the glowing dog-thing with the rune carved skull clearly visible inside it's head. "You guys will do anything to get out of keeping watch..."
armor class is improved by 1, moral is 12, they can naturally see invisible creatures, and they count as enchanted animals. Today is the first in a week long (at least) series of posts inspired by a Paladin in Citadel's post about magical skulls in Dungeons and Dragons.